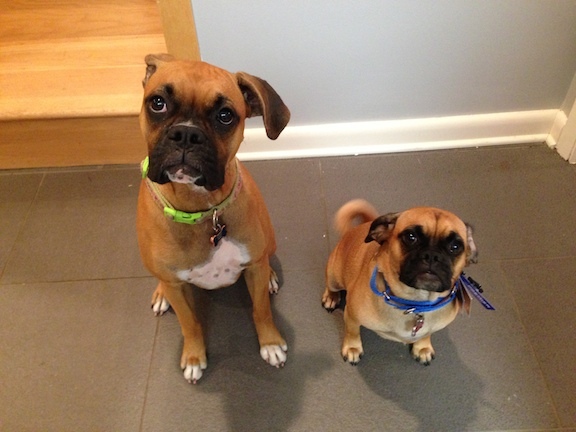 Let me introduce Maggie, a one year old Boxer, pictured here with her room mate and pal Ella, a one and a half year old Puggle. When we booked the session, their owner said that Maggie was almost completely untrained and Ella had a strong desire to chase cars. When I arrived for the session, both dogs met me excitedly at the door, but showed some nervous behaviors, especially Maggie. Maggie seemed to need to follow, either her owners or Ella. While its natural for dogs to congregate around others, Maggie seemed to be doing so in a needy way. This sort of behavior usually indicates a dog that lacks confidence, and it was pretty clear that was the case for Maggie. As soon as we walked into the living room, Maggie jumped up on the couch and started to piddle which her owner said happens often. Excited urination is an involuntary response triggered by over excitement or stimulation. To stop the urination, I took Maggie by the collar and pulled her off the couch so I could put her on a leash. Once she was on the leash, I stepped on it about 2 feet from her head to put her into a dog time out. It took a minute or two, but eventually she settled down and sat down next to me. As soon as she sat down, I scooted the foot on the leash closer to Maggie to take the tension off of the leash. A dog will always pull against a tense leash so you should avoid pulling a dog along or into position unless its unavoidable. I suggested that Maggie’s owners repeat this procedure every time she started to get too excited. Adding a constructive consequence like this consistently when the dog gets over excited will help Maggie learn to settle down faster. In time it will help her learn to govern her energy level on her own. After Maggie settled down I took my foot off the leash and she walked away calmly. While her energy did not spike back up right away, I did notice that she showed zero respect for their owner’s personal space. She sat or leaned on her owners almost any time she was near them. The only time she wasn’t near a human was when she was following Ella. Because their owners would instinctively pet Maggie any time she was nearby, they were unknowingly reinforcing the leaning and also stopping her from learning to be confident in herself. To change that cycle, I suggested that they adopt the “No free lunch” methodology. No Free Lunch means that their owners stop providing any attention or affection to Maggie unless she does something to earn it first. This can be as basic as giving the dog the sit or lie down command when it paws for attention. By only rewarding the dog when it follows a command, their owners can use positive reinforcement to communicate what the dog can do to make them happy. Ive found most dogs want to please their owners, but often, the owners don’t make it clear what they want from their dog. Next I took Maggie into another room away from Ella. I wanted to work with her individually to help her start to develop a skill set on her own. Dogs are similar to people in the way that they gain confidence when they master a new skill. So adding a skill that she learns without Ella in the room will help her learn to be more self sufficient. I started out by going over a few new methods of communication and consolidating the command words that her family used with their dogs. Its pretty common for family members to use different command words for the same action. While “come,” “come here” and “over here” mean the same thing to an english speaker, they are completely different to a dog as dogs hear the sound of words, not the words themselves. When everyone uses a different command word, the dog has to learn them all. Make it easy for your dog to understand you by using the same ingle word commands. We finished up the session by installing a more structured way of feeding the dogs. I had their owners put food into their bowls, but not allow the dogs into the room. By asking the dogs to respect a boundary of 10 feet or so, and eating in front of the dogs as they wait, we can help the dogs practice waiting for consent. By the end of the session, Maggie was much calmer and was responding to corrections from the youngest of the family’s girls. It will be important that all the members of the family continue to practice the calming, time-out technique, consolidating their command words and enforcing clear rules and boundaries to help Maggie adopt a more calm demeanor and energy level. As this becomes the case, her excited urination and other behavior issues will dissipate and eventual stop altogether.